Block has revised and updated the book throughout, including a new introduction addressing what has changed—and what hasn’t—in the twenty years since the book was published and a new chapter on applying stewardship to the common good of the wider community. 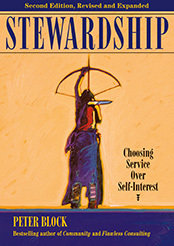 He covers both the theory of stewardship (in particular how it ameliorates the shortcomings of traditional leadership) and the practice (how it transforms every function and department for the better). And he offers tactical advice as well on gearing up to implement these reforms.